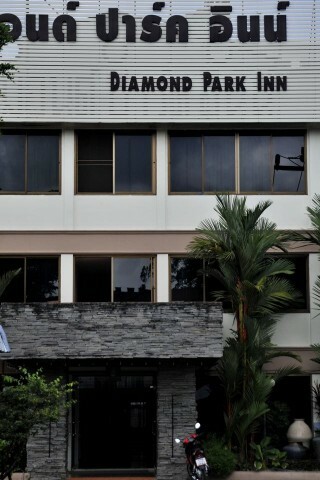 The Diamond Park Inn is a small, generic style hotel with clean, comfortable rooms at good rates and a location not too far from the centre of town, all up making for a very useful Plan B. Ad Book now! Rates from US$35++. Average rating 7.5 from 620 reviews. It’s set down Phaholyothin Road, as it leads south from the centre, but is situated back a distance from the main road, ensuring traffic noise isn’t an issue. Rooms come with tiled floors and simple decor but are spotlessly clean and well appointed with; cable TV, WiFi, fridge and spacious bathrooms with hot showers. The price also includes breakfast but they did point out it was primarily Asian style and a ‘Western’ breakfast is an extra 100 baht. Coffee was good anyway and their friendly little restaurant area looking out onto the street, with a few outside tables, is a pleasant spot to sit. In fact the whole place was friendly with a good atmosphere and while it may not be a first choice is a very good back up address during high season.